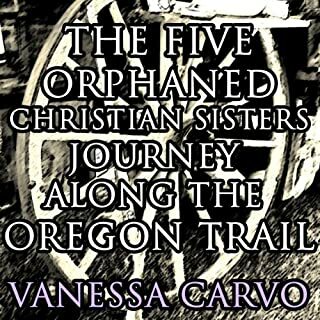 The Five Orphaned Christian Sisters Journey Along The Oregon Trail, is a moving story about five orphaned sisters and what they find during their journey in a wagon train, west to Oregon. It's a story about love for some of them, faith in God, and the redemption of one lost soul who started the journey all alone. With their uncle to guide and protect them, as well as their strong faith and love of God, they are able to prevail and look forward to their new life on the west coast during the mid-1880s. 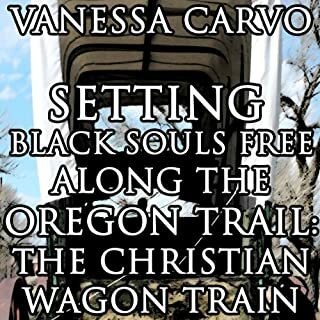 Setting Black Souls Free Along The Oregon Trail: The Christian Wagon Train, is a wonderful Christian novella with scriptures, about one woman's fight to free the slaves which a single family owns, as they head west along the Oregon Trail. It's a family consisting of one father and his six sons. The youngest son is already a believer but the woman has a hard time in convincing the others that all people deserve to be free and have the chance to learn about Jesus. Gradually, she is able to convince the group of men, except for one, to realize that God's word is the truth. 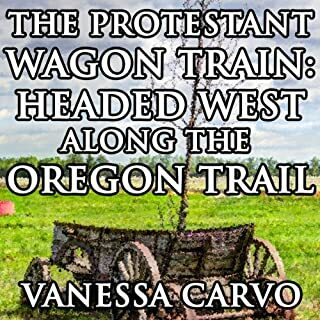 The Protestant Wagon Train: Headed West Along The Oregon Trail, is a story of a Protestant family, their daughter and a young man who saves the family bible from destruction one evening after an almost disaster that runs through the wagon train's campsite. There's love which develops along the way and family life afterwards when they reach their destination. Generations grow and flourish, guided by the old family bible. When Jessie, a woman traveling west to an already established mission, finds a wounded Native American man, despite much opposition, decides to nurse him back to health because she knows it's what God wants. Despite hatred amongst some members of the train for the young man, she triumphs and is able to get him back on his feet, even though another attack almost kills him again. 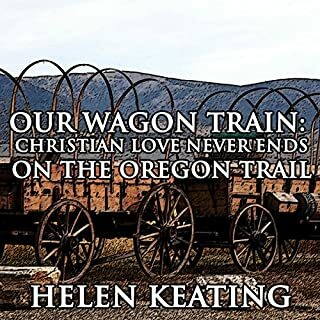 Our Wagon Train: Christian Love Never Ends on the Oregon Trail is the story of a woman whose husband is killed in an attack on their wagon train, leaving her alone with her two children and parents. She bears a terrible burden after retaliation in self-defense, and it's only when they come upon a wounded man wandering the trail on his very tired horse that the redemption starts. She and the rest of the wagon train decide to make camp and she tends to his wound. Heading Towards A New Life Along The Oregon Trail, about a young woman with a baby and a somewhat checkered past who joins a wagon train and the only single women's wagon on it. There, she becomes friends with a female doctor and another woman as they struggle through the many trials of such a journey. Along the way a strong bond is formed between the women, two of the men on the train, and God. This audiobook contains powerful Christian influences, love, family and other related themes meant to make you smile! Our Wagon Train Heading for Greener Pastures Along the Oregon Trail is a Christian pioneer novella about one family's journey to the West and about the hardships which had to overcome. Only their strong faith and love for God carried them through each day to their ritual of gathering together and reading from the family bible after supper. As they get towards the end of their journey, there's a major decision to be made. Mail Order Bride: Widowed, Jilted, and Pregnant on the Wagon Train West is a truly emotional and spellbinding story of a fiercely independent French woman who is first widowed, and then pregnant, then jilted by the man she corresponded with to become his mail order bride. After the long journey from Europe to the US, she decides to undertake an even longer and far more hazardous one, when she joins a wagon train and a family on their way to Salt Lake City. 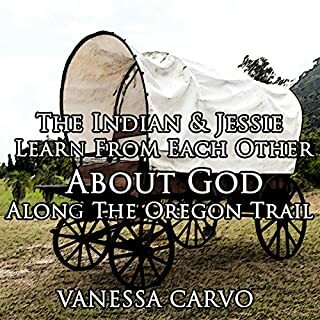 The Baby Left Along The Oregon Trail & Rescued By Christian Pioneers is a heart-warming story about a poor wagon train making its way along the Oregon Trail. The train may be poor but the Christians on it are strong. A Native American baby is found along the trail by one young man and he takes it immediately to the wagon train. There are no nursing mothers on the small train and no source of food for the infant. Our Christian Wagon Train of Freedom: Christ has Set Us Free on the Oregon Trail, is the story of Maria, who travels along the Oregon Trail with her sister to meet Levi, her future husband and a rancher in California. Managing to survive the tests that a wagon train can give to a young woman unused to manual labor, she arrives at Levi's ranch with a surprise. A few family slaves accompany her and Levi tells her clearly that they won't be slaves on his ranch. Love Born On A Wagon Train Headed West, is an emotional wagon train love story full of drama and love and regret and optimism and just about every other human feeling you can imagine. A young woman, professionally trained cook to a small wagon train, is heading west and towards a new life and career. She hopes to push some of the bad experiences in her past out of her mind and replace them with better ones. Becky, a widow who was abused by her former husband, is weary of love. Luke, a cowboy from Texas is seeking a love that he once had. He is a God-fearing man who lost his wife and children in a wagon accident years ago. They have both grown accustomed to their lonely lifestyles and lack of companionship. God begins to work through them, and leads them to begin a correspondence via a mail order bride advertisement. 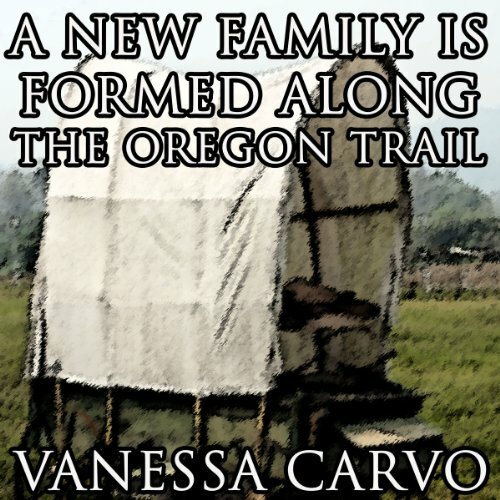 This is the story of a young woman who lost her parents at the start of their journey west along the Oregon Trail. Close to her as she travels along, is a group of young men and boys who had also lost their parents and had decided to make a new beginning in the west, raising cattle. While bathing at the river one day the woman hears, then sees, a baby crying and she retrieves a young Native American infant found propped up against a tree. The wagon full of brothers helps take care of the baby but they are all cautioned to keep the child a secret from the rest of the wagon train. It is very hard and all of them seek God's help in both resolving the crisis, and keeping the child safe.